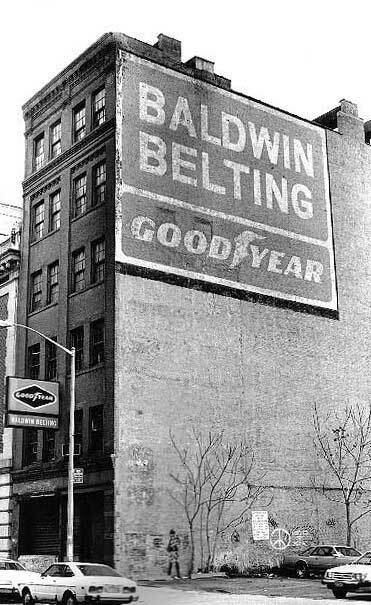 The name changed to Baldwin Belting, Inc. in 1944. They moved into this building at 286-300 Spring St. in 1965, and remained here until going out of business in 1989. Principals in 1945 were Preston de Grauw Baldwin, pres. ; Hazel R. Baldwin, sec. ; Corinne A. Sherman, treas. ; Felix Einingis, supt. In 1934 their product was advertised as Oak Tanned Leather Belting. In 1961 the products were Flat Leather Belting for Power Transmissions; Flat Rubber Belting Transmission, Conveying and Elevating; also Fabric Belting, Round Belting, V-Belting, Leather Packing, Belt Lacing; All Types of Rubber Hose.